Prayagraj, January 12: Levelling up the preparations for one of the largest religious gatherings in the world ‘the Kumbh Mela’, Yogi Sarkar this year gears up to replicate the mela by spreading over an area of 45 km. From using artificial intelligence to building the largest temporary city in the world, here's how Prayagraj is gearing up for Kumbh Mela 2019. Pilgrims visiting the holy city will also get a glimpse of Akshay Vat, a banyan tree held sacred by Hindus, and Saraswati Koop, a well believed to be the source of the mythical Saraswati River. Along with it, a new road leading to the Akshay Vat tree is being built to facilitate pilgrims. The 2019 Kumbh Mela will commence on January 15 on Makar Sankranti which will be the first bathing day. Mahashivratri on March 4 will mark the last bathing day. Prime Minister Narendra Modi, during his visit to the city earlier this month, said devotees will be able to offer prayers at Akhsay Vat, which has been closed for 450 years, during Ardha Kumbh. A new temporary city has been set up along Prayagraj, which has 250-km long roads and 22 pontoon bridges. For the first time, an Integrated Control Command and Centre has been established in the Kumbh area. The system will facilitate controlling and keeping safe the traffic movement and the crowd coming to mela. In addition to the launch of rescue operations, UP police have acquired quad bikes for quick movement on the sand of the Sangam area. These hi-tech quad bikes have wide tyres and a powerful engine, which makes it easier and quicker to move swiftly on the sand during emergencies. In addition to the launch of rescue operations, UP police have acquired quad bikes for quick movement on the sand of the Sangam area. These hi-tech quad bikes have wide tyres and a powerful engine, which makes it easier and quicker to move swiftly on the sand during emergencies. It is for the first time that devotees will be arriving in the city through land, air and water routes. The Indian Railways will run 800 special trains to Prayagraj. Air India has also announced new flights to the Kumbh Mela. 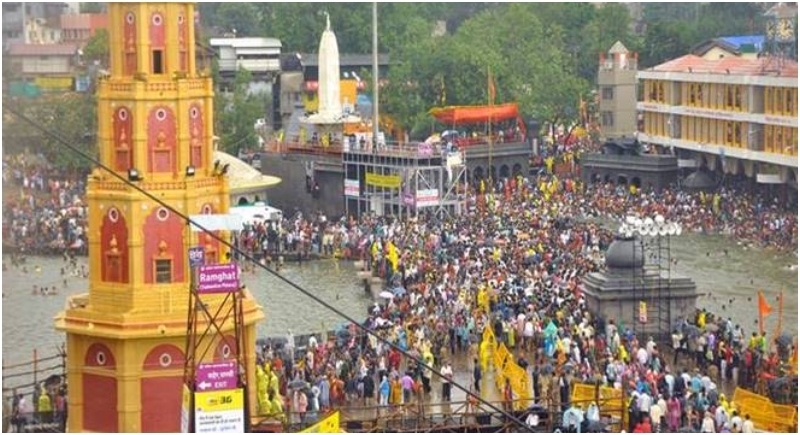 Uttar Pradesh State Tourism Development Corporation (UPSTDC) has announced the launch of a helicopter service namely 'joyride' for a tour of Kumbh 2019. This helicopter service will start from January 17 and would continue till February. The geographical location of Kumbh Mela spans over four locations in India and the mela site keeps rotating between one of the four pilgrimages on four sacred rivers; Haridwar on the Ganges in Uttarakhand, Ujjain on the Shipra in Madhya Pradesh, Nashik on the Godavari in Maharashtra, Prayagraj at the confluence of the Ganges, the Yamuna, and the mythical Sarasvati in Uttar Pradesh.